Hello, friends! After a busy summer of travel, we’re back at it, and we’d like to share some new #favoritethings that we’ve discovered along the way. Up this week is The Wilderking Trilogy, by Jonathan Rogers. 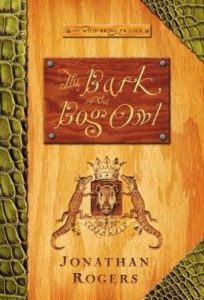 As a boy mom, I’m always looking for a good read-aloud that will engage my sons’ imaginations and stir them toward nobler thoughts. The Wilderking Trilogy most certainly delivers. The antics of our favorite characters elicited delightful giggles, and the action kept them asking for “please, just one more chapter!” But these books aren’t just a fun read–they explore themes like loyalty, friendship, courage, stewardship, and wisdom. 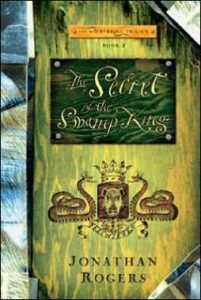 In the second book, The Secret of the Swamp King, Aidan is sent on a seemingly impossible quest into the Feechiefen Swamp, where no civilizer has been known to enter and come back alive. Aided by unlikely allies, Aidan discovers harrowing truths that keep him on the run to the heart of the swamp–and back again. In the third book, The Way of the Wilderking, Aidan emerges from a three-year stint in the swamp to news that a rebellion has formed by a group who call themselves the Aidanites. Believing Aidan to be the fulfilment of the ancient “Wilderking Chant,” they determine to overthrow their tyrant king–without Aidan’s blessing. However, when Aidan finds himself exiled while the Pyrthens threaten to overtake all of Corenwald, the rag-tag group of men that surround him may be the nation’s only hope. I’ll not spoil the ending, but rest assured it’s a worthy end for such a tale. As if the stirring story weren’t enough, you’ll come away with a few gems that linger beyond the story. Why, just this week I heard my husband again using the phrase “live in the grace we’ve been given.” A take-away like that is worth the price of admission. 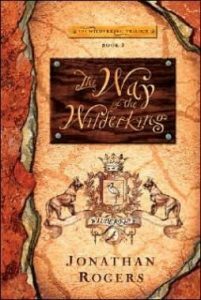 Get the Wilderking trilogy and read it aloud. You won’t be disappointed.